Following days of tense “will they or won’t they” — have the votes, that is — the Senate passed a Republican tax bill this weekend, setting the stage for the most significant changes to the country’s tax system in a generation. You’d be forgiven for missing some of the details: The Senate considered amendments well after business hours before passing it at 1:39 a.m. on Saturday morning. Beyond the big issues that still must be worked out between the two chambers’ bills, like where to set individual income tax brackets, there are plenty of education issues at play as well. Still pending are House-Senate fights about tax treatment of bonds for school construction and how much, if anything, teachers may deduct from taxes when they pay for their own supplies. The Senate’s party-line vote early Saturday morning sets up negotiations between the two chambers on a final measure. 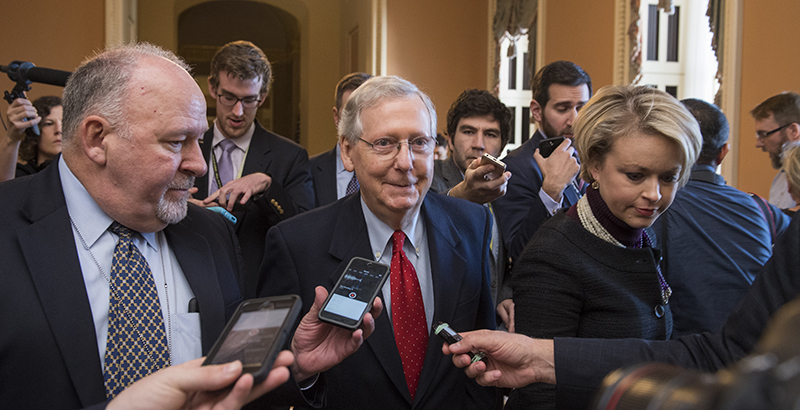 Republicans have said their goal is to pass a final bill before Christmas. “Congressional insiders” say a deal could be hashed out in about a week, Politico Playbook reported Monday morning. There’s plenty else pending, from a looming government shutdown Friday to a possible fix for DACA. Senators, in one of their final middle-of-the-night votes, voted to allow families to save up to $10,000 for K-12 education tax-free in 529 savings plans, which are currently used for higher education. The amendment, from Sen. Ted Cruz, Republican of Texas, would permit the funds to go to private school tuition or homeschool expenses. “By expanding choice for parents and opportunities for children, we have prioritized the education of the next generation of Americans, allowing families to save and prepare for their children’s future educational expenses. Expanding 529s ensures that each child receives an education that meets their individual needs, instead of being forced into a one-size-fits-all approach to education, or limited to their ZIP code,” Cruz said in a release. Earlier in debate, senators had considered but ultimately didn’t adopt an amendment from Sen. Orrin Hatch, Republican of Utah, that would have made 25 percent of tuition at religious schools a charitable donation eligible for tax deductions. The Cruz amendment matches similar language in the House bill, though it doesn’t include homeschool expenses. The Senate bill also wouldn’t allow the creation of 529 plans for unborn children; Senate rules governing the fast-track procedure leaders used to move the bill block legislative changes not related to taxes and spending, Bloomberg reported. Teachers unions, school boards, and other groups have panned the effort. Choice advocates have praised the measure as allowing more options for families, though they raised concerns that it wouldn’t help low-income families who can’t afford to save the tuition to start. This issue — how much of state and local sales, property, and income taxes taxpayers may deduct from their federal income taxes — is seemingly solved. Senate lawmakers adopted the House’s provisions, which allow a deduction of up to $10,000 in property taxes. Limiting federal deductibility of state and local taxes would mean bigger tax bills overall, leading to pressure from taxpayers to lower state and local taxes. That could have a major impact on education, since those two levels of governments provide over 90 percent of funding to public schools. Despite the seeming agreement, advocates remain concerned, and Republicans from high-tax states like New York and California, whose votes are vital to pass the final compromise, particularly in the House, are looking for additional changes. “Public schools have not fully recovered from the Great Recession. Now, by eliminating the state and local tax deduction, the Senate just voted to blow a hole in state and local revenue to support public education, potentially risking the jobs of hundreds of thousands of educators, exposing public school students to serious and potentially damaging consequences — ballooning class sizes and overcrowded classrooms that deprive students of one-on-one attention,” Lily Eskelsen García, president of the National Education Association, the country’s largest teachers union, said in a press release. Rep. Tom Reed, Republican of New York, told The Washington Post that the deduction for property taxes is a good first step but that he’s “advocating strongly” for deductions for income taxes as well. Sen. Marco Rubio, Republican of Florida, proposed doubling the child tax credit to $2,000 and expanding it to benefit more low-income families. The amendment would have made the credit refundable against payroll taxes, like those that pay for Medicare and Social Security. That would benefit families whose income is so low they don’t pay income taxes. He proposed paying for it by raising the corporate income tax rate from 20 percent to not quite 21 percent. It’s currently 35 percent. Senators voted down the amendment, 29–71, though eight Democrats voted for it. Republicans opposed the method of paying for it. Though some progressive groups said adopting the amendment would be one way to help families, a majority of Democrats opposed it, saying it didn’t do enough for families and ultimately wouldn’t end up in the final bill, The Washington Post reported. The final Senate bill raises the child tax credit to $2,000 but doesn’t make it deductible against payroll taxes; the House bill raises it to $1,600. Under both bills, the credit would be refundable in some circumstances, though only the first $1,000. The House bill applies to children up to age 17, and the Senate bill to age 18. The benefits of the child tax credit fade out for higher-income earners, though both measures increase that upper threshold, from $110,000 for married couples to $230,000. Early education advocates had hoped the tax bill would include an expansion of the child care tax credit that helps pay for day care.